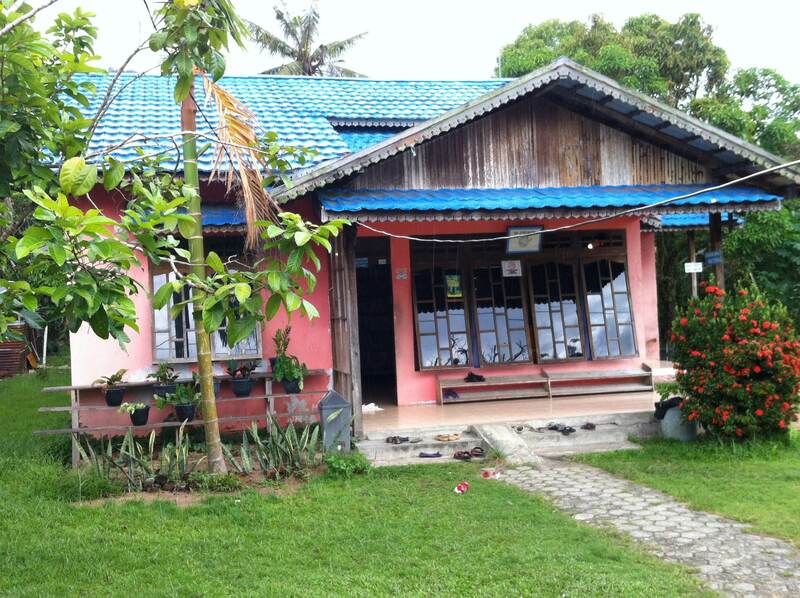 This post provided by Lauren Herbert, my dear mother, who spent the month of April working as a volunteer physician at ASRI in Borneo. Updated to reflect corrections about HIH and ASRI’s collaborative relationship and plans for the future. It is hard to make out the objects in this photo. Two children of the forest restoration site coordinator made the little fence, house on stilts, and bridge out of sticks. A little plastic truck is going across the bridge. The area where the children played had been cleared, and the ditch dug, by reforestation workers as part of a fire break to protect the newly-planted trees from tossed cigarettes. There are many stories behind this simple construction. 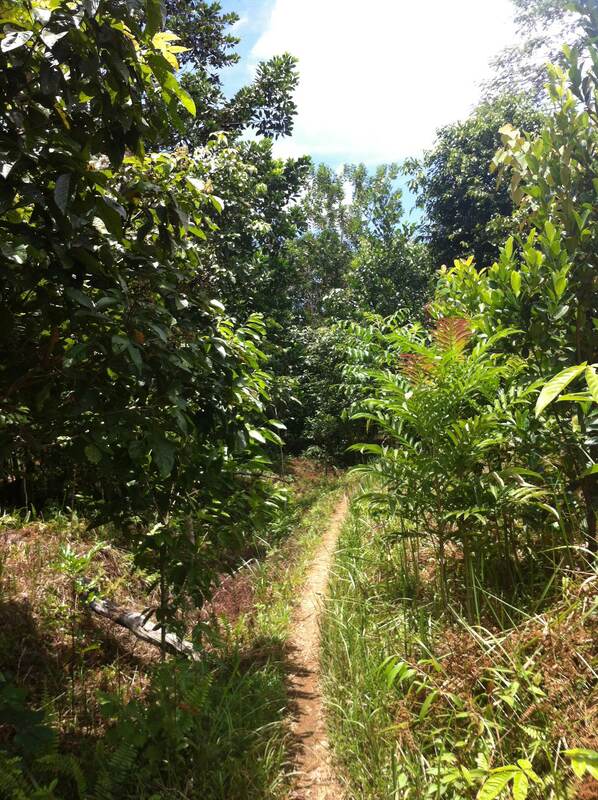 In April, other HIH/ASRI volunteers and I visited the reforestation site, and heard the stories. The first story is of trying to restore rainforest. Much of Borneo was once covered by rainforest. Between 1985 and 2001, 56% of the island’s rainforest was cleared, and even more has been cut down since. Trees are sold for lumber, with single logs providing significant income. Other forest land has been cleared for palm oil plantations or agriculture. The life of a rainforest is in its vegetation. Falling leaves and logs and other organic matter quickly decompose and become reincorporated into growing plants. Once the forest is removed, little can grow in the poor soil. In Borneo, a hardy grass can take the forest’s place. The roots create mats that prevent other plants from growing. Fires sweep through the grassland, killing tree seedlings, but not the roots of the grasses, which quickly regrow. Reforestation of logged areas is a battle that requires human intervention. ASRI/Health in Harmony (HIH) is committed to fighting the battle to restore rainforest in Gunung Palung National Park in West Kalimantan, Borneo, Indonesia. Health in Harmony (HIH) is an organization which was founded in 2005 to address human and environmental health simultaneously. ASRI is HIH’s first major project. (ASRI stands for Alam Sehat Lestari. In English, this translates as “healthy nature everlasting. ” The word asri in Indonesian means harmoniously balanced). ASRI works simultaneously on rainforest conservation, providing medical care, and helping to develop alternative income sources for people in villages around the rainforest. By helping take care of the needs of the people, ASRI indirectly helps protect the forest. Gunung Palung is a 225,0000 acre national park. Despite its protected status, it lost an estimated 22,000 acres of forest to illegal logging between 1998 and 2004. The park is home to 10% of the world’s remaining population of Orangutans, and to many other endangered species. 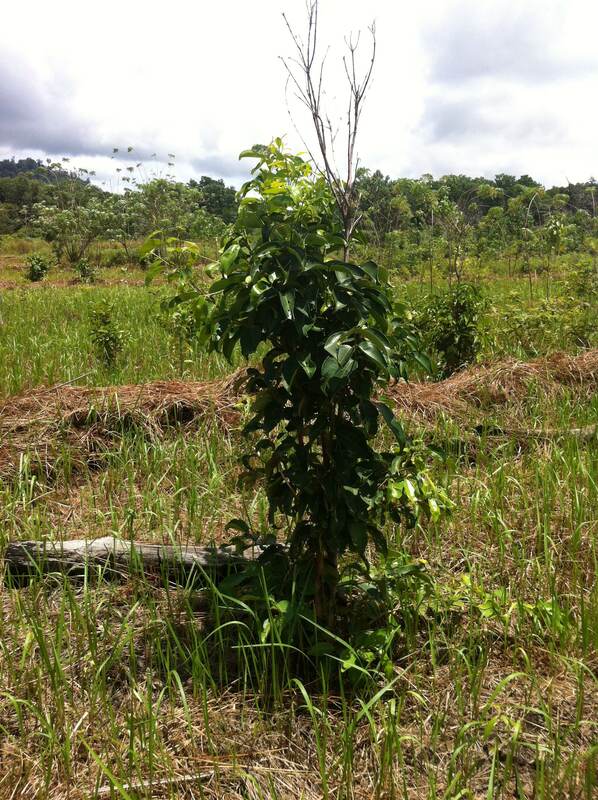 About 7 years ago, ASRI began replanting two of the logged areas. Community members, ASRI staff and volunteers collected seedlings and seeds, cut back grass, dug through the mat of grass roots, and planted the seedlings, choosing one portion of the land to plant each year. On September 28, 2013, a Saturday when nobody was on site, ASRI workers received a call that there was a fire. They gathered people together to battle the blaze. Despite their efforts, 90% of the area was burned and many of the replanted trees killed. 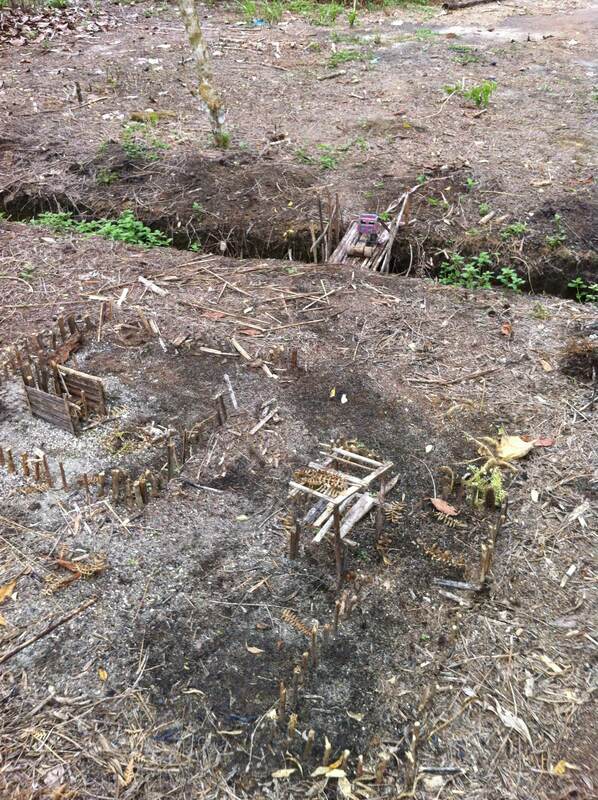 ASRI started over, but this time, widened and improved the fire break, and hired a site coordinator to live on-site. They are also studying the trees that did survive, to determine which species can tolerate possible future fires. Replanted area that did not burn. The second story I learned later, as I talked to the other ASRI doctors, and is about the children’s mother. She seemed to all to be quite healthy, but one day developed chest pain. She went to the ASRI clinic. While the doctors have excellent clinical skills, the clinic has limited medical equipment. The doctors suspected tuberculosis (very common in this area) and a collapsed lung. They sent her 2 hours to Ketapang, the closest city with a hospital that had both x-rays and the ability to treat a collapsed lung. She died that night. While the reasons for her death are not clear, the ASRI doctors feel they may have been able to save her life, if they had been able to diagnose and treat her collapsed lung promptly. ASRI will start construction of a new hospital in June. It will have an x-ray and a laboratory with more diagnostic tests. Two ASRI doctors are receiving specialty training in surgery, and in obstetrics/gynecology. With the new hospital and specialized doctors, ASRI will be able to take care of more complicated patients. A view to the mountains. Finally there are the stories of Hotlin Ompusunggu and Kinari Webb, two doctors who started HIH and ASRI after noticing the close link between human and environmental health. As an undergraduate student, Dr. Webb studied orangutans in Gunung Palung. She witnessed men from surrounding villages cutting down trees, and was surprised to learn that many who cut the trees did so to pay medical bills. She returned to the U.S. and went to Yale Medical School, then completed her residency in family medicine in California. She resolved to return to Indonesia, and start a clinic that would acknowledge the link between environmental health and human health. A mutual friend introduced Dr. Webb to Hotlin Ompusunggu, a dentist who had experience not only in providing healthcare to poor communities, but also in disaster relief and community development. Together, they developed the initial ideas and plans for ASRI. Before constructing the clinic, Dr. Webb, Dr. Ompusunggu and other ASRI staff met with the communities surrounding Gulung Palung to see what they needed. The ideas from these meetings were incorporated into the design of ASRI. Fundamental to the model is integrating medical care with conservation projects. 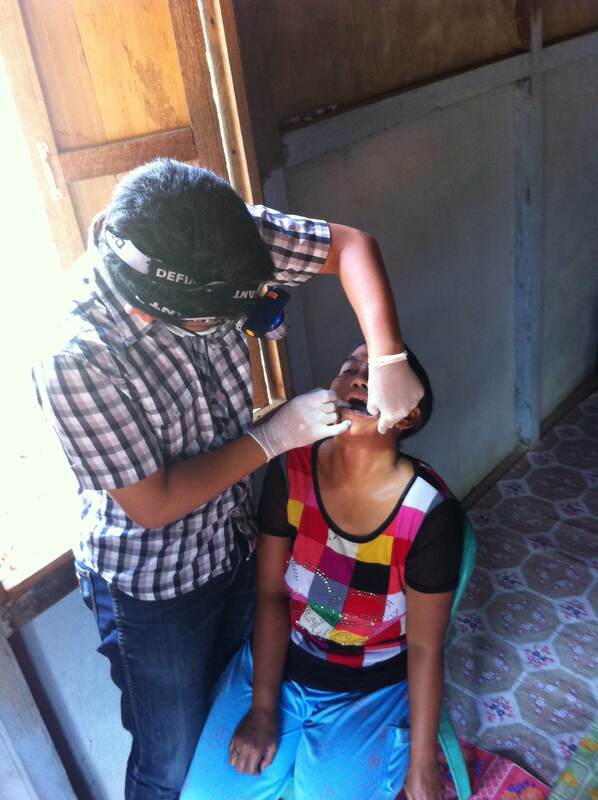 The clinic is staffed by 3-4 Indonesian physicians, a dentist , and 1-3 international volunteers. ASRI chooses its local physicians not only for their academic achievement, but also based on the shared ideals of serving poor patients in a respectful and compassionate manner. Several of these physicians have spent months at Yale and Stanford medical schools for advanced training. 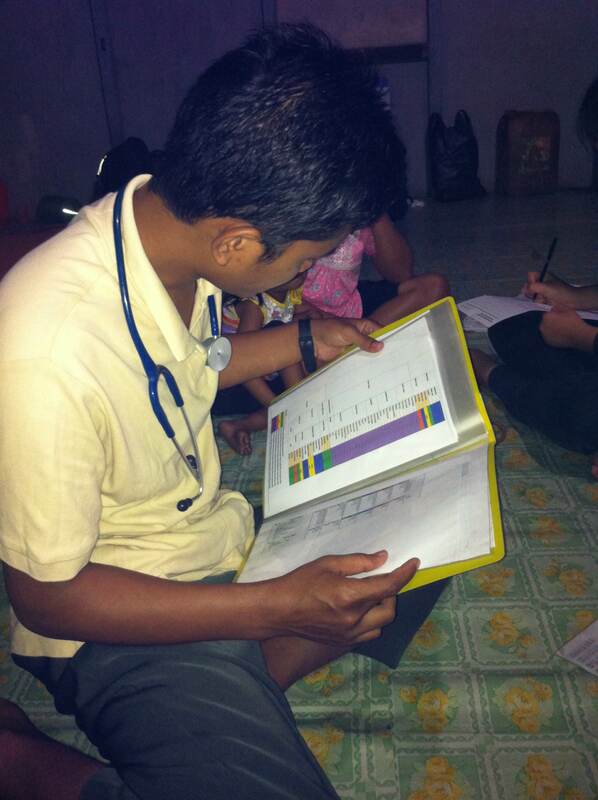 Volunteer physicians from Yale and Stanford act as consultants to the Indonesian physicians. Together, they work to provide the highest quality care that circumstances allow. Rounds, discussions of patients and educational sessions are modeled after routines at Yale and Stanford hospitals. With construction of the new hospital, availability of more laboratory and radiologic tests, and availability of specialty care, the quality of care will be even better. At ASRI, the cost of care is discounted based on the compliance of the patient’s community with laws that prohibit cutting in the national park. Patients can pay with labor, crafts, seedlings, and manure. Discounts based on community compliance with logging laws cause social pressure within the community to maintain environmental standards. Assessing discounts for healthcare based on protection of the rainforest. The conservation program includes not only the reforestation projects, but also support for forest guardians who monitor deforestation, a sustainable agriculture program, goats for widows, and environmental education. The forest guardians are respected members from communities around the national park whom ASRI pays to monitor cutting of trees and to seek out solutions to problems in their local communities. ASRI builds new programs or revises old ones based on their suggestions. The sustainable agriculture program gives loggers an alternative source of income. By using methods that do not rely on commercial pesticides and fertilizers, former loggers have been able to start farming at a low cost. The nutrition of the community members has improved as vegetables have become readily available. While providing goats for widows does not directly affect deforestation, it provides an income for people who need a source of money. ASRI gives each widow a goat. The widows repay the gift by giving ASRI the first-born goat, which ASRI then gives to another widow. Conservation staff provide environmental education not only to adults in the communities, but also to 10 year-olds, through a new program called ASRI kids. ASRI hopes that environmental education for youth will lead to improved environmental consciousness in the community. All the people working on the projects meet in a circle every morning to discuss their work, going around the circle one by one until there is no more to say. The report of the night watchman is given the same time and respect as the reports from the construction manager, the dentist, the ASRI manager, the physicians, and conservation workers. Most are young and passionate, and are able to pursue their passions and ideals. What makes this project work so well? Can the same principles be applied elsewhere? One such component is that ASRI directly links environmental health with human health. Another is that methods of healthcare payment also promote environmental health. Finally, all patients and staff are treated with respect and are allowed to contribute in the ways that they are able. HIH is exploring options to further ASRI’s work in Borneo and their broader work abroad. Leaders of the project have been in contact with experts in social and environmental justice in Indonesia, who may visit in the coming year. They hope to study the project’s successes, focusing its impacts and spreading its success to other parts of the developing world. There is something intangible about this project that has drawn people from around the world. Not only has ASRI attracted physicians from Yale and Stanford, but also physicians from other states and countries, architects from Georgia and Oregon, dentists from Indonesian and Spain, and even a fashion designer from Jakarta (she plans to develop a new ASRI-inspired line, with profits going to ASRI). Health in Harmony, the nonprofit supporting organization in Portland, has drawn donors from all over the world. What about the project intrigues people so much? Perhaps it is the fact that it addresses health so comprehensively. True health requires not only access to good medical care, but also having the financial means to provide basic needs. Broadly, true health also means taking care of our environment. Only by becoming stewards of our environment can we ensure access to sources of sustenance, medicine, and other basic resources for ourselves and future generations. Thank you Forest, for sharing your moms writing. Lauren it’s wonderful to hear about what you’ve been doing and understand where you’ve been. You both are doing great things, and inspire me. Thank you for your kind words. I’m inspired by the force and increasing frequency of interjustice projects like ASRI. Thank you for carrying on the work in El Salvador. Lauren, that is such a great summary of the project and, implicitly, your role in it. I’m very proud of both you and Forrest for your principled stand on the key issues in the world today. Thanks, Dad. We have been inspired by you. Thank you for sharing this. It is really inspiring. Lauren, thank you for participating. I can’t wait to hear more when you return.